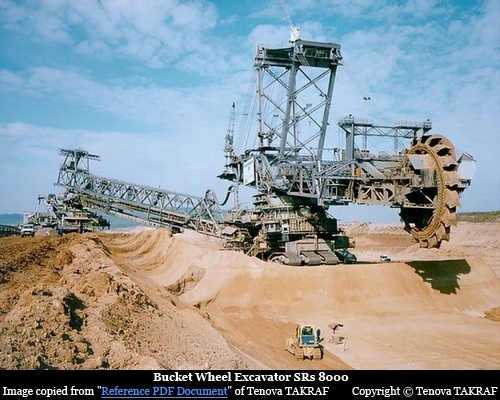 Bagger series Bucket Wheel Excavators, made by the German firm Tenova TAKRAF (formerly MAN-TAKRAF), are the largest terrestrial vehicles ever constructed. The biggest and the latest amongst these is Bagger 293 (aka Tenova TAKRAF SRs 8000 and formerly known as RB 293). It holds the records for the largest terrestrial vehicle in the Guinness Book of Records. Built in 1995, it has a gigantic length of 240 metres, height of 96 metres and weighs 13,000 tonnes. The size of its impeller is 21.6 metres - almost reaching an eight story building. Compared to it the length of famous NASA crawler, which transports space shuttles to the launch pad, is mere 40 metres. It's capable of digging and moving about 240,000 cubic metres of earth per day which means it can dig a football field to a depth of 30 meters in a single day. Although Bagger 293 is the biggest, other excavators in this series are equally impressive. Its nearest rival and sibling Badger 288, built in 1978, is 220 metres long and has a height of 96 metres. Others in this series are Bagger 281 (built in 1958), Bagger 285 (1975), Bagger 287 (1976), Bagger 291 (1993), etc. 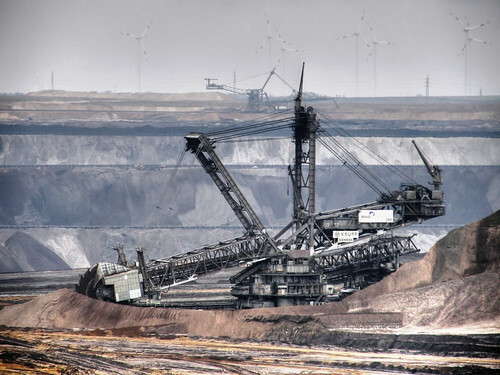 These gigantic metal beasts are used in the German strip coal mines of Hambach and Garzweiler. 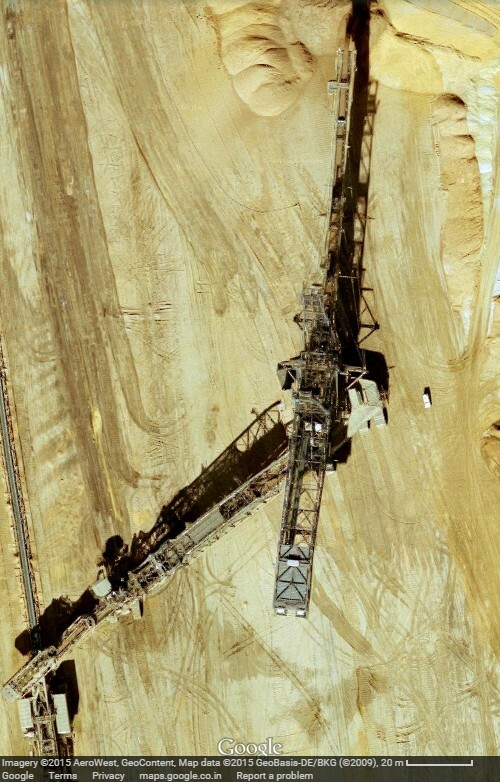 Following image taken from Google Maps/Google Earth is probably of Bagger 288 at the Garzweiler coal mine. 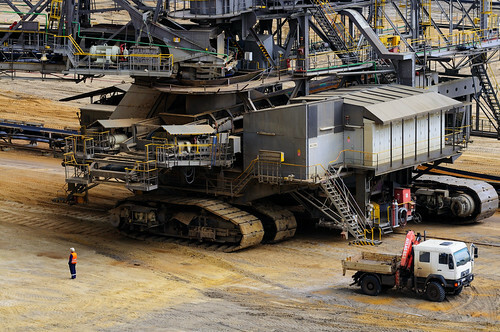 Bagger 288 is slightly smaller than Bagger 293, which is located at Hambach coal mine. "By February 2001, the excavator had completely exposed the coal source at the Tagebau Hambach mine and was no longer needed there. In three weeks it made a 22 kilometer (14 mile) trip to the Garzweiler mine, traveling across Autobahn 61, the river Erft, a railroad line, and several roads. The move cost nearly 15 million German marks and required a team of seventy workers. Rivers were crossed by placing large steel pipes for the water to flow through and providing a smooth surface over the pipes with rocks and gravel. Special grass was seeded to smooth its passage over valuable terrain. Moving Bagger 288 in one piece was more economical than disassembling the excavator and moving it piece by piece." View in Google Earth Google Maps - Bagger 293(?) at Garzweiler coal mine. View in Google Earth Google Maps - several Baggers at Hambach coal mine. Why don't you restart it? Thank for your nice comments. I have restarted the quiz in a different format. Pl see "Daily Quiz from Past Posts" in the right side column. Try to guess the story behind the pictures without mouse over the images.